Some of the services we provide are HVAC System Cleaning & Restoration/Air Duct Cleaning, HVAC Fire/Smoke/Water Remediation, Indoor Air Quality (IAQ) Assessment and Improvement, UV Light Cleanser, Filter Supply, and Dryer Vent Cleaning. 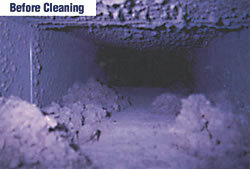 Air circulation ducts become dusty and moldy presenting substantial health risks for building occupants. Impossible to filter, the only way to get rid of duct-born contamination is to have them cleaned. Coffey Clean Care strives for total ‘source removal cleaning,’ the National Air Duct Cleaners Association (NADCA) standard which means all supply and return ductwork is accessed to remove light and heavy debris. 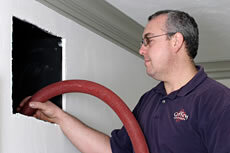 At Coffey Clean Care, we understand that choosing an air duct cleaning and restoration company can be confusing and frustrating. We have designed this page to be friendly and informative. For any question you may have regarding your home or office's indoor air quality, we have an answer or links to the appropriate government or industry agency. Coffey Clean Care’s goal is to provide the best cleaning and restoration services available today. Your health, comfort, and satisfaction are very important and our work is guaranteed! In preparation, a ten-inch diameter access port is cut into the main supply and return trunk line for our vacuum hook up. This applies vacuum (negative-pressure) to the entire duct system and prevents airborne particles from blowing out the vents. 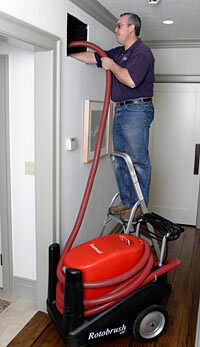 This step involves high-compressed air cleaning of all registers in the house. This is done with specialized air tools that not only clean the vent but are also designed to fit through the louvers to clean behind them. We drill 1-inch access ports into the main and branch runs of the duct system so a tool known as an air whip designed specifically for duct cleaning can be introduced. This tool has multiple whips at the tip of it and is powered by approximately 200psi air pressure. This enables the tool to snake its way through the duct and aggressively beat all sides of the duct, loosening all dirt/debris and pushing toward the powerful vacuum. The whips are inserted into each and every duct mechanically removing all the debris. Once we ensure a completely cleaned system by manual, visual, and/or camera inspection, the access ports are sealed. The vacuum access is sealed with a finished galvanized sheet metal plate that is zip screwed in place. The 1-inch ports are sealed with an airtight, flush-fitting cap plug. We clean the blower housing of your furnace with compressed air. An anti-microbial treatment to deodorize and inhibit growth of bacteria, mildew, and mold can be fogged into the duct system. NOTE: We’re not forgetting the leading cause of house fires: YOUR DRYER VENT! 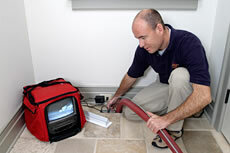 Contact us to discuss our intuitive and cost-saving methods for duct cleaning, commercial and residential.